‘Doctor Who Adventures’ is a weekly (formerly fortnightly) magazine published by BBC Magazines aimed at younger readers based on the long-running science-fiction television series produced by the BBC. The magazine launched with its first issue cover-dated 5 April 2006, priced £1.99. 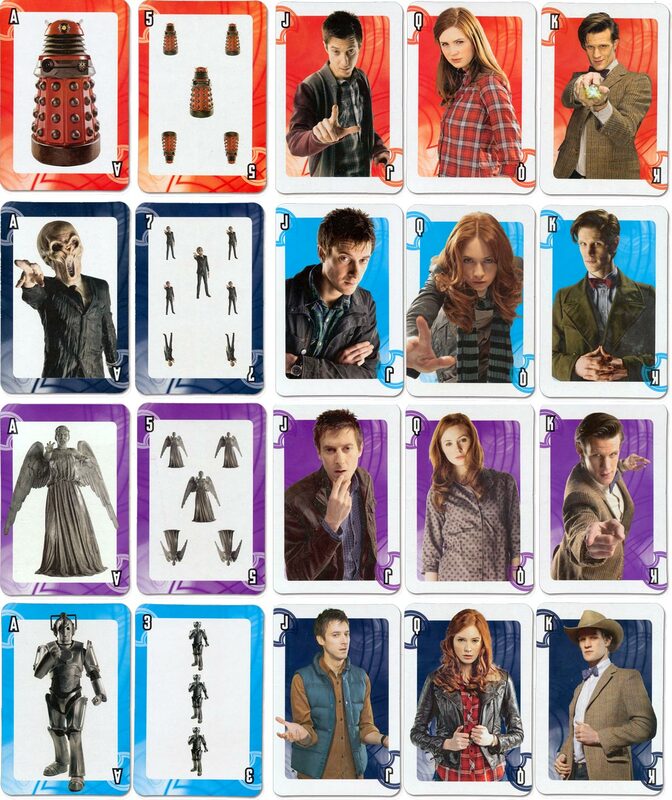 From time to time free playing cards are included with the magazine and some of these are shown here. 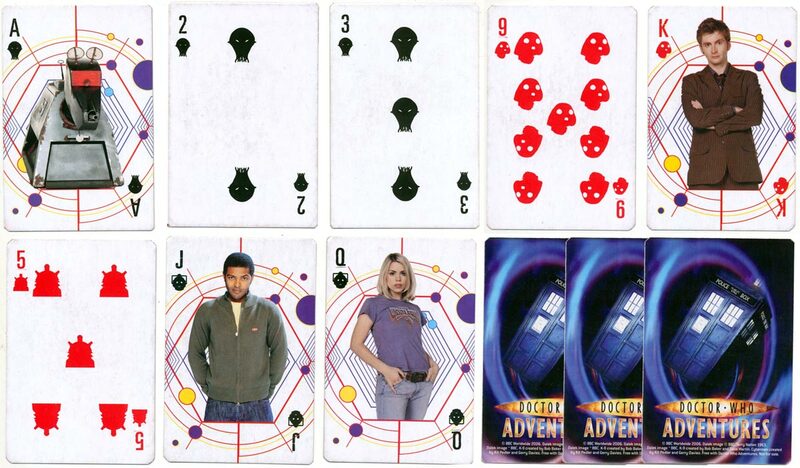 Above: in 2006 the children's magazine 'Dr Who Adventures' included a free deck of cards based upon characters from the BBC television sci-fi series 'Dr Who'. The suits have been replaced by characters from the series, Daleks, Cybermen, Slitheen and what looks like Ood. © BBC Worldwide 2006. Dalek image © BBC/Terry Nation 1963. Dalek image ™ BBC. K-9 created by Bob Baker and Dave Martin. Cybermen created by Kit Pedler and Gerry Davies. Images courtesy Matt Probert. Above: a freebie with the children's magazine 'Dr Who Adventures' in 2009, they are notable in that the suits have been replaced by characters and are colour coded. Images courtesy Matt Probert. 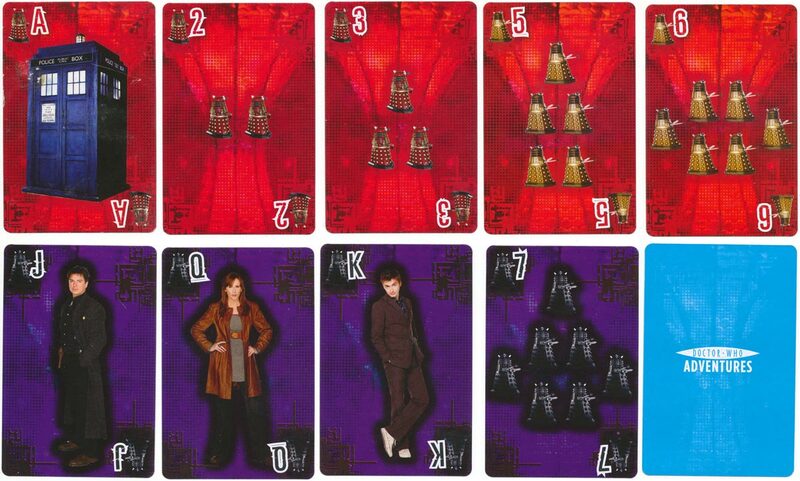 Above: free cards given away with the children's magazine 'Dr Who Adventures' with colour-coded suits of daleks in red, gold, black and silver. Images courtesy Matt Probert.